Alexander Liberman was a painter, sculptor, and photographer. Born in Kiev, Russia, his family relocated to London while he was a child. Later moving to Paris, he entered a career in publishing. Prior to immigrating to the United States in 1941, Liberman studied art in Paris under French cubist André Lhote (1885-1962). Upon entering the publishing world, Liberman did not return to art again until the mid 1940s and from the 1950s onward, he followed a parallel career in painting and sculpture. Liberman favored abstraction rather than realism throughout his artistic development. 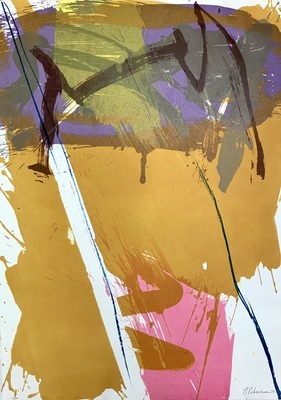 During the 1950s his style was hard-edged and linear, while his approach in the 1960s and 1970s was more painterly, as seen in the Abstract Expressionist print by Liberman from the For Meyer Schapiro print portfolio.